It's been a hectic and pretty stressful week at work, but once all the visitors left I managed to get another playtest of Codename: Vacuum in at the end of the week with Ian, who played it last week too. We played exactly the same version (though with different decks) and the game came in under an hour including set-up, rules refresher and explanation of the new decks. So far so good. The game went well, we got into space, there was a couple of clear strategies being followed and at the end we both scored well. For the second time Ian beat me at my own game (need to change the rules again! ;-p). One of the things I like about Vacuum, and one of the core tenets of the game is the scoring. There are five core decks in the game that you play with every game (in addition to a few extra decks that change every game). Each of those core decks (Military, Exploration, Population, Trade and Knowledge) has a victory condition that will score each player 0-30 points depending on how well they've followed that strategy. The game ends at the end of the round that the second (with 2-3 players) or third (with 4-5 players) victory condition is selected. Selecting a victory condition is key to the game - you want to hone your deck so that it will score big in a couple of conditions (particularly a lot bigger than your opponents!) and then select the appropriate condition. Since only two or three get chosen, it's very important that you get your choice in, so there's a lot of pressure to quickly get to the point where you can afford to select a condition and then select it - thereby hastening the end of the game. Selecting a condition uses some of the cards that gain you points in that condition, so each turn you choose whether to gain points in your chosen condition (and risk leaving it too late to select a condition and missing your chance) or selecting a condition (thereby hastening the end of the game before you can maximise your score in that condition). It's part of what I like about the game. Unfortunately, I think the pressure is too strong, at the moment the fear of missing your chance to select means that you rush the game to an early end, before it really gets into full swing. I'm considering making the game fixed length - 15 turns (Ian and I have played 12 and 10 in our last two games). Everything else stays the same, except now selecting a condition doesn't prematurely end the game. This will have two effects I expect: the game lasts slightly longer and the game end dynamic changes. Now you're not rushing to end the game, but to choose the scoring. If you select early, you guarantee that your chosen scoring will happen, but you give your opponents more turns to respond - adapting their strategy to maximise points in that condition. Choosing late means that you might miss your chance, but you keep your opponents guessing and can wait until the endgame and pick the one that finally ends up favouring you the most. Another busy week. This time it's been Codename: Vacuum, Zombology and crazy ideas. I didn't have any travel this week, so I managed to get a lunchtime playtest in with Ian on the new version of Vacuum. I'd made a bunch of changes since the fairly broken play at Games Night a couple of weeks ago, and we tried them out over lunch. 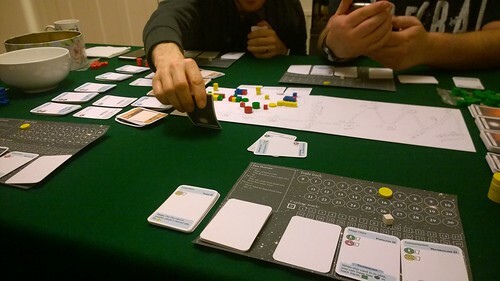 I was pretty sure we could get a 2-player game done in under an hour, so I did a quick canvas and Ian signed up. He'd not played it before, so we had a 20 minute setup and rules explanation followed by a 58 minute game. Considering that was Ian's first play I was pretty happy with it coming in under an hour. He picked it up pretty well and ended up beating me 30-18 (time to change the rules!). The improvements I'd made last week fixed most of the problems, though there were a few graphic design/wording issues that I spotted during play. I'm happy to play that version again without changing it though, so a big step up on last time. Games Night was pretty epic, with the first visitation of Mal so far this year and an amazing six different games played. It was a great night, and we finished up with a Zombology (which we'd not played for a while) and I was telling them about the recent pre-orders I'd taken and how I was considering another print run - at which point I took another pre-order. I'm really torn about it. I think Zombology is the best game I've designed, and with its silly theme (mad 'scientist' hippies trying to cure the Zombie Apocalypse), wide range of players (3-8) and short play time (10 minutes) it's also my most accessible game. I'd love to see it get a wider audience and the pre-order rate for a second edition (despite the fact I'm not yet making one) has been pretty high the few times I've introduced it to people recently. I could try pimping it to publishers, but it turns out that I really enjoy the graphic design and hand-crafting of games, so I'd rather self-publish again. The big stumbling block is time. I travel quite a lot for work, have a young family and I'm two months away from becoming a dad for the second time. I know from last time what a wreck that leaves you, and how little free time you have when you've a new baby and are so hideously sleep deprived that 7:30pm sounds like a reasonable bed time. After testing the new version of Codename:Vacuum a couple of weeks ago, I clearly needed to make a raft of minor changes. The game was so broken that the rules were evolving as we played (always a bad sign! ), but I was generally pretty happy with the new version (once fixed!) compared to the last version of 2015. My travels continued last week, with a trip to Manchester on Monday after work that concluded on Wednesday night, and despite being incredibly busy (I was working late into the night Monday and Tuesday), I did manage to get make some progress on Vacuum. Firstly finishing off the board on the train on Monday night and then printing and cutting out a new version on Thursday morning (which I had off work to go to the doctor). I finished the final cutting out on Saturday night - after the mental week and a few bad nights' sleep I was too knackered to make it to Newcastle Gamers unfortunately. What I need to do now is try out the new version (and buy some more ink! ), to see if the changes I've made improve things. I'd rather not play on Games Night on Thursday as the guys played it last time and they deserve to play something that works. That leaves a lunchtime playtest session or an additional evening for a playtest (either with Games Night mates or Newcastle Playtest chums). Next week is pretty busy (we've a big company meeting with a couple of evenings out) so it's this week, or not for several. I'll have to see what I can fit in. It's been a great week for my gaming. Monday went exactly to plan with me printing and cutting out all 350 cards for new Codename:Vacuum, and hand-scrawling a quick board too - for the first time in two years I had a Vacuum prototype. Admittedly, Monday ended slightly worse with my dentist extracting a wisdom tooth that's left me eating very gingerly all week! 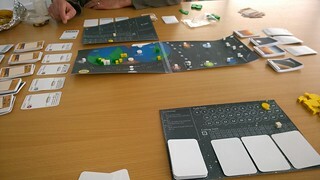 I got a lunchtime gaming session in at work on Wednesday (Coup) and then at Games Night on Thursday we played Vacuum! The lads had all played Vacuum before many years ago, so it wasn't complete fresh to them, but they'd all forgotten how to play. It was, as I expected, fairly broken - we hardly got off Earth due to a poorly shuffled deck and a far too slow explore mechanism, so there was no colonisation of the Solar System or vast space battles. There were a couple of other things that clearly didn't work as intended, so the rules were evolving as we played. In a perfect world the game would take around 15-20 mins per player once you know it, so I was reasonably pleased with just under 2.5 hours (including set-up and rules explanation) for a four player game where 3/4 of us were effectively beginners. Hopefully that will significantly shorten with experience (and rules that aren't in flux during the game and cards which accurately describe what they do!). I was frantically scribbling notes during the game, so that on Friday night I could spend the 3.5 hours of train journeys to Bedford updating the cards and working on an improved board. Of course I now need to print and cut out another version! Saturday I was in Bedford seeing Terry, Andrew and Graham who I used to game with weekly when I lived there during 2008-11, the latter half of my Reiver Games days. There were eight of us in total, so we started off with a couple of games of Zombology (five of the eight owned a copy), playtesting the new rules with large groups. It went well, with a couple of late wins and I ended up taking a couple more pre-orders from David and Richard, both of whom have bought a Reiver Game in the past I think. That's now five pre-orders from seven possible customers in the last month or so. That kind of conversion rate is filling me with a greater optimism than I previously had, if I can get to thirty-ish I may well push the button and make another hand-made run of a hundred or so. The clock is ticking though, The Wife and I are expecting a little sister for The Daughter at the end of May, so the amount of time I'll have for hand-crafting games in the evening will be severely limited by extra parenting duties and sleep deprivation! After Zombology, we played another eight games, of which four were new to me, so it was a great day's gaming as well as a great chance to catch up with friends I see far too infrequently. Saturday evening was also spent on trains (and replacement bus services) so I got a chance to do more work on the Vacuum board. I think the board brings a new element to the game that focuses you more on the exploration and conquest side of the 4X game, so I think that part is working as intended, what I need to do now is print out another version and see if my changes fix the issues we found. Thursday's playtesters are at least interested to play again!